Industry Leader in improved clinical outcomes, higher patient and provider satisfaction and implementation of models for efficient care. I am proud to be a part of an organization that is committed to developing a new care management model for urban populations that puts patients and their community above all else. CarePoint Health, a premier integrated healthcare system based in Hudson County, New Jersey is proud to announce the appointment of Dennis Kelly as Chief Executive Officer. Dennis was formerly the Chief Strategy Officer of CarePoint Health and is a highly accomplished healthcare veteran who has worked closely with CarePoint Health over the past two years before permanently becoming part of our team. As CarePoint Health CEO, Dennis will now oversee Bayonne Medical Center, Christ Hospital, Hoboken University Medical Center, CarePoint Health Medical Group, CarePoint Health Research Institute and its affiliated subsidiaries. 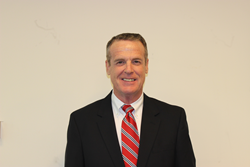 Dennis Kelly has been involved in healthcare for over 38 years and has extensive executive experience in developing and leading innovative healthcare service organizations that align the entire provider network. The results of this provider alignment are improved clinical outcomes, higher patient and provider satisfaction and an efficient model of care. He received his bachelor’s degree in business administration from Westminster College and his RT.R from the University of Utah Medical Center. Prior to joining CarePoint Health in 2012, Dennis was a co-founder and CEO of NewHope Bariatrics, Inc., where he developed and operated surgical facilities focused on the needs of the morbidly obese in partnership with highly regarded surgeons. Before founding NewHope Bariatrics Inc., Dennis was the Chief Operating Officer for MedCath Corporation, which created an innovative care model primarily focused on treating patients suffering from cardiovascular disease. Multiple studies confirmed that this patient focused care model allowed MedCath to treat sicker patients, reduce mortality, complication rates and hospital length of stays that generated savings to the Medicare program. Prior to joining MedCath, Dennis returned to healthcare services after 15 years of experience at Siemens Medical Systems where he held positions as the Vice President of Government & National Accounts and was responsible for developing and implementing the market strategy within the Government and National Accounts market segment. CarePoint Health brings quality, patient-focused health care to Hudson County. Combining the resources of three area hospitals – Bayonne Medical Center, Christ Hospital in Jersey City, and Hoboken University Medical Center and its affiliated medical practices– CarePoint Health provides a new approach to delivering health care that puts the patient front and center. We leverage a network of top doctors, nurses and other medical professionals whose expertise and attentiveness work together to provide complete coordination of care, from the doctor’s office to the hospital to the home. Patients benefit from the expertise and capabilities of a broad network of leading specialists and specialized technology. And at CarePoint Health, all of our medical professionals emphasize preventive medicine and focus on educating patients to make healthy life choices. For more information on our facilities, partners and services, visit our website, http://www.carepointhealth.org.